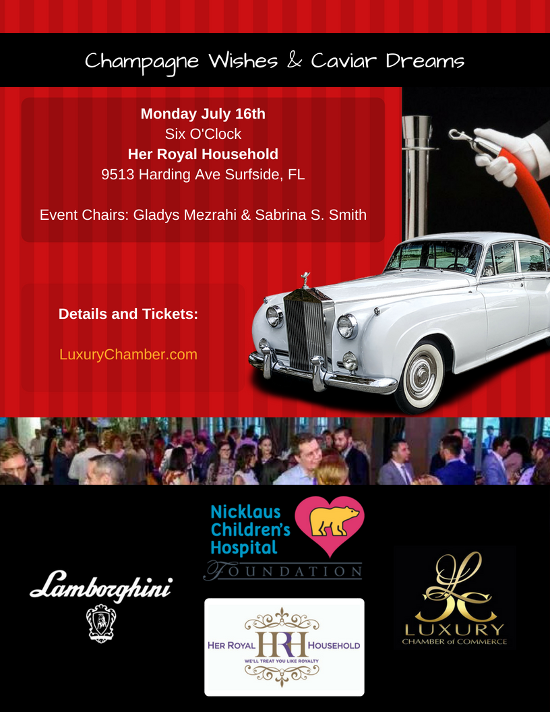 Surfside, FL, – Luxury Chamber of Commerce is pleased to announce a networking event taking place at Her Royal Household; a distinctly British retail boutique featuring Wedgewood China and opulent home furnishings located in Surfside, FL adjacent to the Bal Harbour Luxury District. The event will present an opportunity to network with purveyors and consumers of luxury goods and services as well as fashion designers, local notables and even some British expats. Event attendees will a enjoy complimentary Lamborghini brand champagne as well as paired British canape's and or tea. Learn about fine china and formal British place settings. See royal wedding artifacts on display. Meet British delegates and possibly Consul Generals from other countries as well. Patrons will know they have done the right thing by attending as a percentage of proceeds goes directly to Nicklaus Children's Hospital Foundation which is a 501(c)3 organization supporting the hospital for children battling the worst disease that our youth could ever face. The event takes place from 6-9 pm.